Ranging from beautiful embroidered silk-satins to modern appliqués and matte fabrics, the Japanese prints trend and inspired designs can be geisha gorgeous or appropriated into a modern marvel. Traditional patterns include linear designs of flowers, fish and birds – especially cranes that represent long life. Always inspirations to fabric designers and in turn fashion designers; Japanese prints are noted for their simple elegance and extraordinary aesthetics. Pair a Japanese inspired item with your everyday style for some casual elegance. Although Japanese prints and styles are not exactly a new trend on the catwalks this season, the trend is evolving on the streets with ready to wear and vintage pieces being adopted into wardrobes everywhere. We especially love the tailored delicate floral patterned pants look teamed with some warm winter jackets to keep a touch of femininity when the mercury drops. No longer bound to the after-five timeslot, metallic garments are making appearances in broad daylight with flashy results. Although not particularly new, the trend is moving from fashionistas to the fashion conscious and is becoming more widely adopted – and so it should be. Easily dressed up or down and with the unique ability of going from the office to a night out-after-work, metallics are a look that’s easy to wear and adapt to your own personal style. With many options of how to make this look work best for you, we recommend trying metallic shoes and accessories first for those that are slightly faint of heart. As one of the curiously chic, we suggest trying the middle ground of metallic fabrics such as silk taffeta jackets and coats or even lurex knits for winter. For the braver belle de jour we stand by glitter, sequins and metal on clothes – we know you can work it with no risk of looking like a garish drag queen. 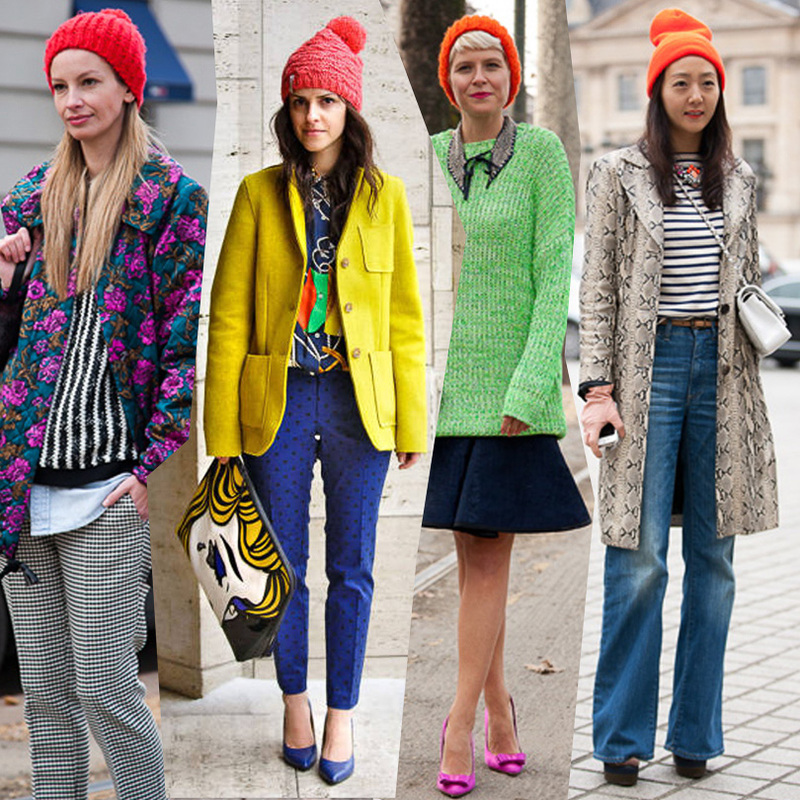 The best and possibly most wallet friendly way to keep warm this season is with a tangerine or red beanie. Let the warm tones remind you of better weather and the cute and cuddly knitted hat keep your ears nice and toasty. Team your beanie with other bright winter woolies for a delicious and do-able amount of colour clash that will brighten anyone’s day. Whether with or without the adorable pom-pom this look is perfect for everyday or just set aside to make the best of a bad hair situation. The extra crafty and creative among us can potentially make one themselves and those of us that are more time poor can easily pick one up at a variety of stores.